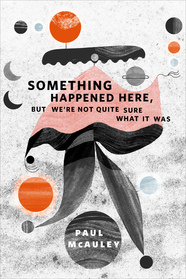 Published today, my story 'Something Happened Here, But We're not Quite Sure What It Was' is now up at tor.com. And is also available as an ebook in the UK and US on Kindle and all other platforms. It's a Jackaroo story, set in Joe's Corner, a little crossroads town in the middle of an alien necropolis that also features in my latest novel, Into Everywhere. 'City of the Dead', a kind of prequel to 'Something Happened', is also available as an ebook on Kindle in the UK and US. The splendidly strange cover illustration is by Eleni Kalorkoti.